Notre maison en bord de mer de deux étages offre une vue de chaque pièce et une brise tropicale qui coule de la coupole du toit à travers toutes les fenêtres et les portes. Le salon principal est à l'étage avec 4 chambres et 3 salles de bains, y compris deux suites de maître une avec un lit queen et une avec un roi. La troisième chambre a un lit king et le quatrième trois lits jumeaux. Il y a une grande cuisine ouverte, salon et salle à manger avec une zone de pont ouverte pour manger et se prélasser. Au rez-de-chaussée, vous trouverez un salon et une salle à manger à côté de la piscine avec barbecue. Il y a aussi une salle de 16x16 au bord de la piscine avec une salle de bain adjacente, qui est un lieu de détente pour lire ou se reposer et peut être utilisée comme un espace de couchage supplémentaire. (Les futons sont disponibles à la maison.) La maison est située sur les falaises surplombant l’océan et offre de belles vues sur la migration des baleines à bosse en hiver, des phoques moine hawaïens et des dauphins et des tortues toute l’année. La piscine à débordement et le spa apportent l'océan Pacifique directement dans notre cour. Awesome view, beautiful home, amazing vacation! We spent a week at The Cover during our spring break (last week in March). It is a crazy drive down to the house, but we’ll worth it! The view is truly awe inspiring and Melanie and Craig have done a beautiful job setting up there home for the perfect family vacation. If the ocean is calm enough, you can snorkel and explore right there in the cove. Craig also got out his fishing poles so we could do some night fishing, however we never had a clam night. We did enjoy the hot tub under the stars! The house was very comfortable for our large family (two college kids, two teens, two parents). We spent our last day up near the resorts on the Island and we all agreed, The Cove was better!! We arrived after midnight on the first day so it took us until the morning to fully appreciate the paradise this property truly was. The pictures didn’t do justice, the house was amazing. The weather was fantastic, we spent most of our days relaxing at the pool. The cove offers great views of sea life in the tidal pools and snorkeling when the surf was low. Supper on the lanai every night was enjoyed by the amazing sunsets. Melanie and Craig are fantastic hosts and very accommodating. This trip to Hawaii was the best yet and would recommend staying at this property to anyone. We will be back! Leaving the snow for the sunshine! I absolutely loved this home. The beautiful view of the ocean and the rocky shoreline were stunning. We would have loved to swim in the cove or snorkel more, but the winter weather was creating unfavorable conditions. The guys did a little fishing and even caught one fish:) The pool and the hot tub were always inviting. The outdoor space was spectacular. The winding road down to this ocean front home can be a little long...but, with an open mind...it is well worth it! I loved the location. We saw whales and dolphins multiple times. This oceanside retreat was one of a kind. Melanie and Craig were very responsive to our requests and inquiries. We thank them again for opening their home for guests like us! We had a wonderful time at this gorgeous property. The hosts Melanie and Craig were wonderful -- easy to communicate with and such great people! The home was perfect for our group -- 2 families with 4 young children. The house is wonderfully appointed and had absolutely everything we needed to feel at home for a week. The pool and outdoor areas are beautiful and we spent lots of time just staring out at the beautiful ocean, watching sunsets, climbing around on the rocks, floating in the pool and just relaxing. The location is perfect to explore the entire island -- we went all the way up north of Kona to explore hidden beaches, and all the way to the Volcano National Park to check out the steam vents and the volcanic landscape. It was a dream trip and the house was a huge part of making the whole trip just perfect. Thank you, Melanie and Craig! We can't wait to return to your home in paradise! Fantastic home in a great location for visiting southern beaches like Honomalino bay, Green sand beach, etc. also Volcanoes NP (but sadly it was closed during our visit). Home is very well equipped for cooking, the pool and hot tub are amazing, and the views breathtaking. Hosts are very responsive and accommodating. Sure there is a 15 min drive up or down the mountainside from the highway, but totally worth it. Occasionally mosquitoes outside were mildly annoying, but they did not interfere with our outdoor activities - dining, swimming, lounging, and ping pong. Our favorite VRBO ever. Groups of over 6 guests require a minimum stay of 7 nights. 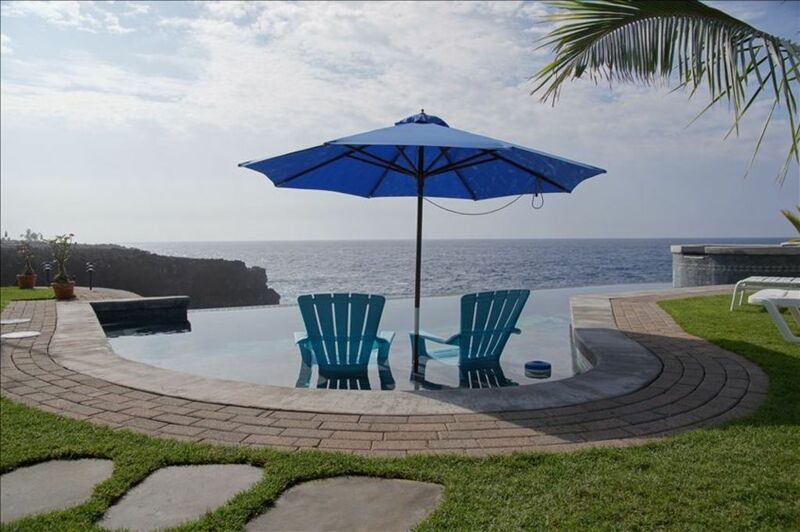 Please call us (808) 328-9947 for up to date discounts and rates for stays greater than 7 nights.